Titan sub would be able to conduct both topside and subsurface science. COCOA BEACH, Fla. — The extraterrestrial seas of Titan, Saturn's largest moon, provide an ideal world for a robotic submarine to explore, and a team of scientists is working on an innovative mission concept that could make that vision a reality. A submarine on Titan would open up the lakes and rivers of liquid methane and ethane that cover the cloudy Saturn moon to exploration. 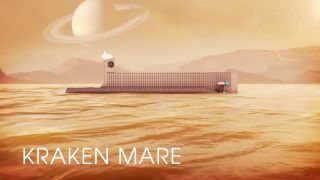 In a NASA video of the Titan Sub mission concept, the robotic submarine sails the Kraken Mare, the largest northern sea on Titan. That alien sea is nearly 600 miles (1,000 kilometers) wide and 1,000 feet deep (300 meters). The concept was detailed during the NASA Innovative Advanced Concepts 2015 symposium, held here Jan. 27-29. NIAC sponsors cutting-edge, innovative and technically credible advanced concepts under the auspices of the Space Technology Mission Directorate at NASA Headquarters in Washington, D.C.
First of all, if you're going to explore Titan, why a submarine? Such a vehicle provides a more efficient, on-the-spot science system, said Steven Oleson, lead of NASA's Collaborative Modeling for Parametric Assessment of Space Systems (COMPASS) conceptual spacecraft design team at Glenn Research Center in Cleveland, Ohio. The sub approach makes the vessel both highly maneuverable and capable of very long-range duties, similar to autonomous underwater vehicles here on Earth, Oleson said. The ethane and methane seas on Titan have been extensively mapped by NASA's Cassini spacecraft, which has been studying the moon as part of its mission to Saturn since 2004, when the probe arrived in orbit around the ringed planet. In January 2005, the Huygens probe — a lander carried by Cassini, but built by the European and Italian space agencies — landed on the surface of Titan, beaming back the first photos of that strange new world. But what's beneath the surface of Titan's seas remains an enigma — one that a submarine could help solve, Oleson and his team members say. The COMPASS team scoped out the submarine idea along with technologists and scientists from The Johns Hopkins Applied Physics Laboratory (JHUAPL) in Laurel, Maryland, and submarine designers from The Pennsylvania State University's Applied Research Laboratory. Oleson told Space.com that the NIAC-funded first-look focused on just the submarine. Follow-on study money, if awarded, would entail research into a delivery system to plop the vessel into Titan's seas. The team initially assumed a lifting-body spacecraft could be used, he said, but they may also consider an inflatable aeroshell or a simple, extended, shaped aeroshell to deploy the long, skinny sub on the Saturn moon. A highly capable science craft for Titan will allow a complete exploration of what exists beneath the waves on another world. Once down on Titan, the roughly 3,000-lb. (1,400 kilograms) submarine would be powered by two Stirling radioisotope generators, which generate electricity from heat produced by a slug of radioactive plutonium. The submersible would then use waste-heat-fluid loops to keep the craft's insides nice and warm. Capable of topside surveying as well as undersea sleuthing, the vessel would tote a meteorology sensor, a light and camera system, sun sensors, a physical properties package, a depth sounder, sample-acquisition gear, and side-scan sonar arrays. Antennas on each side of the sub would allow for surface sailing while maintaining communication back to Earth, either directly or via an orbiter. The team has blueprinted a unique ballast system that would permit the sub to repeatedly deep-dive and resurface over months of operation on Titan. "This submarine study is just the latest of many possibilities considered to explore Titan, which is such a rich environment to explore, in many ways similar to Earth," said Ralph Lorenz, a space scientist at JHUAPL. This near-infrared, color mosaic from NASA's Cassini spacecraft shows the sun glinting off of Titan's north polar seas. The sun glint, also called a specular reflection, is the bright area near the 11 o'clock position at upper left. This mirrorlike reflection, known as the specular point, is in the south of Titan's largest sea, Kraken Mare, just north of an island archipelago separating two separate parts of the sea. Lorenz told Space.com that the last few years have seen a surge in interest in Titan's seas. "Only Titan and Earth have open bodies of liquid like this," he said. Regarding the submersible for Titan, Lorenz said that there are only modest differences between making such a submarine work on Titan and making a regular research ship work. Radar map of Titan's seas. Lines denote the assumed catchment areas for each liquid body. Kraken sprawls across a wide latitude range and is notable for having two major basins (here designated Kraken-1 to the north, and Kraken-2 in the south), which are connected by a relatively narrow strait named the Throat of Kraken. A submersible can do everything a research ship can, Lorenz said, like visit specified locations in Kraken Mare, measure the currents and waves, and see the shoreline. "But it opens up the third dimension. There may, for example, be layering in Titan's seas, much like in some of Earth's oceans and lakes, with different compositions, temperatures and turbidity" at different altitudes, Lorenz said. "You could, in principle, lower some sort of instrument package from a boat, but once you start worrying about winches and snagging and thermal management … in many ways, it is easier to just move the whole vehicle up and down through the 'water column,'" he said. Lorenz said that a submarine is better for high-resolution inspection of the seabed. And seafloor sediments likely have some of the most interesting material on Titan, bearing a record of Titan's complex climate history. By addressing the challenges of autonomous submersible exploration in a cold, outer-solar-system environment, the team's NIAC report said Titan Sub would serve as a pathfinder for even more exotic future exploration of other subsurface water oceans, such as those on Jupiter's moon Europa, which is a prime candidate for life elsewhere in the solar system. Leonard David has been reporting on the space industry for more than five decades. He is former director of research for the National Commission on Space and is co-author of Buzz Aldrin's 2013 book "Mission to Mars – My Vision for Space Exploration" published by National Geographic with a new updated paperback version to be released this May. Follow us @Spacedotcom, Facebook and Google+. Original article on Space.com.